Moving in the Bluish Light will be Brixton-based artist Sola Olulode first solo exhibition at VON GOETZ ART. Previously an artist in residence at the Post_Institute during the inaugural ‘Frieze Week Residency’ between September and October 2018, Olulode’s practice has continued its exploration and representation of Black British girlhood, centralising LGBT nightlife, music, dance and painterly process as key to her current vein of works. Drawing inspiration for its title from the poem Fantasy by Harlem Renaissance poet Gwendolyn Bennett, the exhibition Moving in the Bluish Light touches lightly upon a historical context of expressions of liberation, of power and of independence through jazz, dance, poetry and visual art, not to mention the academic work of Ophelia Settle Egypt and Zora Neale Hurston; anthropologists and sociologists whose research came to redefine the manipulated history of the black experience on their own terms. The Harlem Renaissance represents a period of reclamation and augmentation of African-American art and culture. To consider this history of black identities, challenging social exclusivity and individual/collective expression, therefore, Olulode’s paintings become about social bodies and sites of unity and friendship. In their context, they channel London nightlife in the present – the artist often taking her own photography as a starting point – but the generic “anti-space” of the works removes this spatial hook. Instead, “the blues” appears as a metaphor – a stand-in for a state of mind, energy or harmony. The dreamlike space of the paintings disengages the figures from a definitive context – as they are, the characters of Olulode’s work are fluid and not easily categorised. The liberated body, therefore, is not tethered to rigid formulations of identity that bracket and divide the social body into discrete members. Instead, spectral notions of gender and sexuality underpin how Olulode relates to identity, embracing readings of the works as relating to LGBT (Lesbian Gay Bi Trans) and QTIBPOC (Queer Trans Intersex Black People of Colour). The paintings are representations of joy – it would be too heavy-handed to say they implement a critique – but their stripping away of detail and context often lends them a twisted angle. Dance can be said to be a purely expressive medium; the movements of the body led by both intuitive motion and practised gesture. The body language of dance is its elemental coding, which is in turn framed by a rhythmic tonality. A dance stripped of musical context then becomes nothing but physicality – the body as medium. In Olulode’s paintings, this is starkly realised through isolating the motion of her figures. Centralising the black female body, the silent dance of her paintings projects a confidence and power that echoes in the work of Sonia Boyce and Lubaina Himid. The compositions, however, are prone to inverting themselves; the figures can become placid or out of control, motionless or violent. The translation of the dance becomes miscommunicated and the balance of (interpretive) power shifts dramatically to the eye of the spectator. It is this “see-saw” of expressive/interpretive control rooted in dance that produces a liminal quality to Olulode’s paintings, and encourages a reading of them on the terms of representations of BAME peoples; Olulode constructs an image that is liberated and powerful. Process remains integral to her method of priming and drawing. 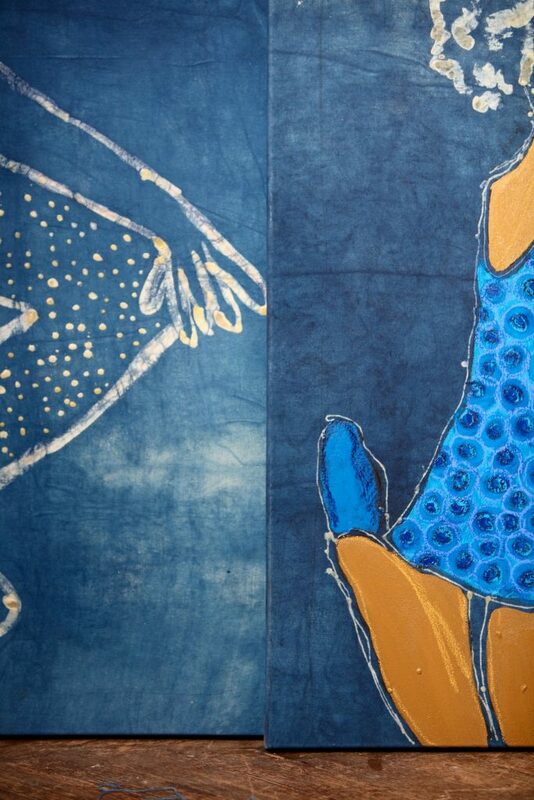 Using indigo dyes and patterns that are inherited from Nigerian traditions the paintings use a wax negative to draw and compose the canvases, through which the rich blue hues of the dye become (not simply applied to the fabric, but) integral to the material. The indigo ground serves as a support for the figures, and in turn highlights and capitalises the skin of Olulode’s dancers. The paintings make us keenly aware of the body language of the subjects and engage the social constructs that are implicated in their compositions, colours, and performative ambiguity. The exhibition will be accompanied by an essay by Lisa Anderson, independent curator, writer and founder of the Black British Art initiative @blackbritishart. This entry was posted in EXHIBITIONS and tagged Sola Olulode, VON GOETZ ART. Bookmark the permalink.